Yogesh Barve, “Global?” 1 & “Global?” 2, 2013. Video. Global? 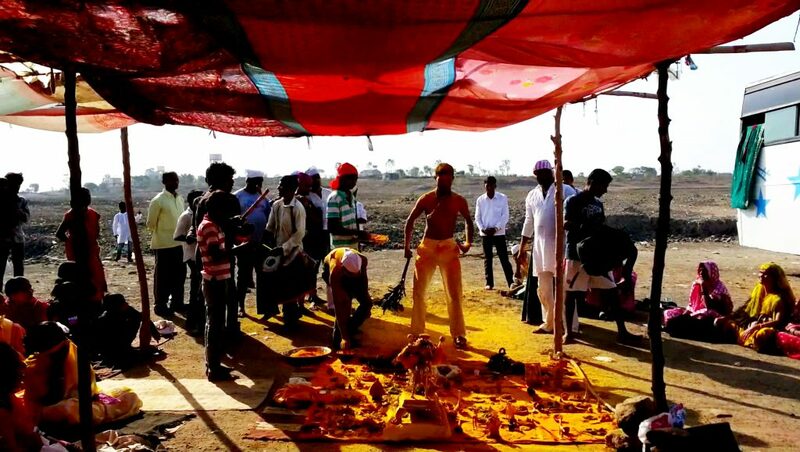 1 & 2 documents an annual event during which people of a particular religious group gather around Jejuri in Maharashtra, India. The six-day festival, from the first to sixth lunar day of the bright fortnight of the Hindu month of Margashirsha is celebrated to allow the meeting of the principle God (Khandoba) with other gods carried from different homes of the patrons who take them back at the end of the ceremony. It is a common belief by ancestral stories that the gods existed in this region. The process of worship is called Tali Bhamdara. During this ritual, the participants try to reach the metaphysical stage and state. The music, repetition and the colors hypnotize the viewer who actively attempts to understand and decipher the rite of escape. Cultural globalization, potential exchanges and experience remains suspended in this space. Hypnosis and the state of being possessed are paralleled with the contemporary virtual environments and the Internet. In using a traditional event of Indian tradition and crossing aesthetic codes of transfixion, belief and hypnotization, Barve raises questions of new forms of colonization.